No, it’s not a dream. That’s what we thought when we were told to check it out. Econet is now selling 1 GB of data for $1 and 3GB for $2. Those are the new prices of the Econet Dream Data Bundles that were introduced last month. In an effort to double down on mobile broadband(that’s where all the attention is going to be this year from the looks of things), Econet has tweaked one of its newest packages in a way that will have a significant impact on internet usage. This is now the cheapest mobile broadband package on the market. Apparently it’s not just the price either. 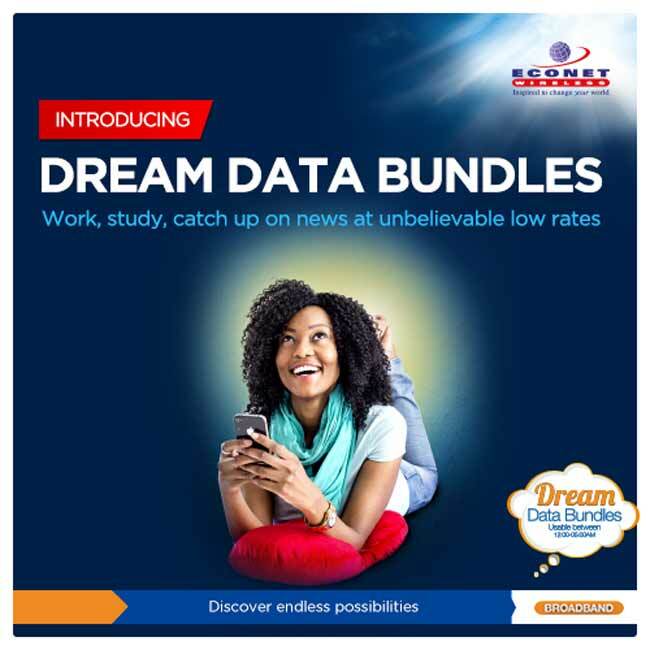 Some Econet mobile broadband subscribers pointed out that the validity period on the dream bundle has also been adjusted from a 12 am to 5 am window to a 10 pm to 8 am slot. It looks like they really listened to the feedback subscribers gave when these dream bundles were introduced. No adjustments have been made to the daily data bundles, the daytime equivalent of the dream bundles, although Econet did introduce a 50 MB – $2 bundle a few days ago. The other mobile operators haven’t made similar changes to their mobile broadband prices and packages. The only competition that Econet seems to be going up against is the coterie of WiFi providers like TelOne that keep adjusting their own packages. what is the FUP? If this is 100% un shaped un restricted and can be accessed through econet wifi zones, then for once I will applaud you econet. Im using Africom. They have a new Night-browsing deal. For $4 i get 7 gig valid for 7 days. I thinks thats cheaper than the Econet deal. And the hours are better, 8pm to 6am. Terry, does this have restrictions or you can download whatever you would like at those times? You can download anything your heart desires. Subscribed for the first time last week. Im definitely subscribing again tmrw when it runs out. A point to note, wen u subscribe on the Africom page, it says its 1 gig a day over 7 days for $4, but in practice it doesnt restrict you to 1 gig a day. You can use more than 1 gig in 1 night but the cap is 7 gig for those 7 days. Wats so funny Anonymous?? Please share the joke. 1. How many dream bundles can you use per day? 2. Does dream bundle work on the LTE dongle? 3. Just to get things into perspective here if we assume a 10% overhead for a download speed of 1Mbps. Why the overhead, well there are signalling protocols that are required to keep the link open your usual layer 4 stuff etc. Then that means you can pull down 1Gb in about 2hours 23minutes. At 7.2Mbps you can do the same excercise in roughly 19 minutes. with all that said, it would seem like a smart idea for Econet to actually not shape the link – my reasoning is especially for LTE and UMTS connections is if I am only going to use the network for 3-20 minutes (broad range i know) on LTE and then free the resource its a pretty good return on a dollar. Think of this in terms of how many carrier slots each base station can hold. The reason why unlimited internet failed for Powertel and Africom is because you had 5% of the subscribers occupying 95% of the bandwidth. But when you limit to say 1Gb then the carrier slot in use has to be released, and the higher the download speed, the sooner that slot will be released for use by another subscriber. Remember on all air interfaces we are all contending for bandwidth on that base station Just my two cents. Have the validity periods changed? The dream bundles/daily bundles have never disappeared on me before – and I’ve used them extensively since introduction. Also, you don’t have to be awake to use them – just schedule your downloads for after midnight while you sleep. There are plenty of download managers that can do that. I am asking validity as in how many days the bundle is valid for not the access times. I read the article, that is why i asked. Mubvunzo wangu ndewekuti bundle re dhora rinoshanda kwemazuva mangani kana ndisina kupedza mukawo wangu wema GB uye remadhora maviri rinoshanda kwemazuva mangani kana ndisina kupedza mukawo wangu wema GB? Understand before you answer Junior. Yes!!! That’s the way Econet: now FIRE SOME MORE PEOPLE and lets get that daily bundle up to 500mb – AHAAA!!! it’s fast people, that is what I used to upgrade my Windows 7 to 10. the download was faster then the installation. I have to say, i am really impressed with the speed of these bundles. It seems as Econet has gone for the the ‘will give you all the speed you need so that you finish your bundle quickly and leave’ approach & it seems to work. I don’t believe i am saying this but GOOD WORK Econet. Hmm interesting, I thought Africom’s Night browser package was cheaper because its $0.57 for a gig if you do the math? I may try this product to compare speeds but I honestly have no complaints about the products except sometimes its difficult to purchase from the portal. If it works then I will have 2 favorite networks! Sad thing is Africom coverage is patchy. Kwedu haibati! I was impressed the first time using the 3gb dream bundle but today 4th Aug 00:21 the top speed i recieved so far is just 36kbs/sec SMH #Econet’sThieveryWays have begun!! I don’t think this has anything to do with TelOne , considering that TelOne has a few wifi zones unlike Econet which has the whole country as its turf.